With the aid of specially commissioned maps, The First 24 Hours D-Day describes the first 24 hours of the Normandy landings and all the events that occurred in each landing zone. Beginning with an overview of the immense preparations for this historic event, it looks at the airborne and glider landings that preceded the main assault, and each of the individual beach landings, from west to east. 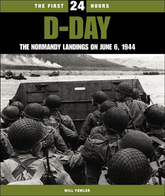 From the slaughter of US troops at Omaha Beach, to the chaotic scattering of airborne forces throughout the French countryside, to the logistical nightmare of consolidating each bridgehead, this in-depth volume brings the turning point of World War II to vivid life with firsthand accounts from both sides of combat.